Below is a Roman Britain timeline, featuring the most important events in the Roman occupation of Britain, from Julius Caesar’s first attempts at invasion to the fall of the island to the Saxons to the military success of the Britons, leading to the legends of King Arthur. 26th – 31st August 55BC Julius Caesar attempted to invade Britain Julius Caesar crossed the Channel with a force of around 10,000 soldiers. They landed on the beach at Deal and were met by a force of Britons. The Romans eventually took the beach and waited for cavalry back up to arrive from France. However, a storm prevented the back up force from reaching Britain and Caesar had to withdraw. July – Sept 54BC Julius Caesar’s second invasion of Britain Julius Caesar crossed the Channel with a force of around 27,000 infantry and cavalry. They landed again at Deal and were unopposed – the Britons had retreated to higher ground. The Romans marched inland and met a large force of Britons led by Cassivellaunus north of the River Thames. After a hard battle the Romans defeated the Britons and some tribal leaders surrendered to the Romans. Cassivellanus ordered crops to be burned and made guerrilla attacks on Roman forces. But the Romans were too strong and Cassivellanus was forced to surrender. In September Caesar was forced to return to Gaul (France) to deal with problems there and the Romans left Britain. 5AD Cymbeline Cymbeline, King of the Catuvellauni tribe, was acknowledged by Rome to be King of Britain. May 43AD Romans Invaded Britain A Roman force of about 40,000 led by Aulus Plautius landed in Kent. They defeated a force of Britons led by Caratacus and began taking the South-East of Britain. Caratacus escaped and fled to Wales where he set up a resistance base. Autumn 43AD Claudius arrived with reinforcements The Roman emperor Claudius arrived in Britain with reinforcements. Colchester (Camulodunum) was taken and eleven tribal Kings surrendered to the Romans. Claudius appointed Aulus Plautius Governor of Britain before returning to Rome. 43 – 47AD Conquest of the South The Romans continued their conquest and by 47AD had conquered the whole of South Britain and claimed Britain as part of the Roman Empire. 47 – 50AD London Founded London (Londinium) was founded and a bridge built across the river Thames. A network of roads was built across the south of Britain. 51AD Caratacus defeated and captured Caratacus’ guerrilla force was joined by other tribes who resisted Roman conquest. and confronted the Romans near the River Severn. However, Caratacus was defeated. He escaped again and sought shelter with the Brigantes tribe. However their Queen, Cartimandua betrayed him to the Romans. Caratacus, his family and other rebels were taken prisoner and sent to Rome. In Rome Caratacus was pardoned by Claudius and allowed to live out his days in Italy. 60 – 61AD Boudicca leads revolt against the Romans Prasatugas, King of the Iceni tribe who had signed a peace treaty with the Romans, died. His wife, Boudicca intended to honour the treaty, but after the local Roman authorities seized Prasatugas’s property and raped his two daughters, Boudicca retaliated by signing a treaty with Trinovantes who were hostile to the Romans. Boudicca is said to have been very tall with striking red hair that hung to her hips. Her army of Iceni tribesmen and women captured and burned Colchester, London, St Albans and caused the governor of Britain, Suetonius Paulinus, to raise the biggest force he could. Boudicca’s army were eventually cornered and massacred. Boudicca poisoned herself to evade capture. 63AD Joseph of Arimathea visited Britain Joseph of Arimathea, one of Jesus’s disciples, was sent to Britain to convert the people to Christianity. 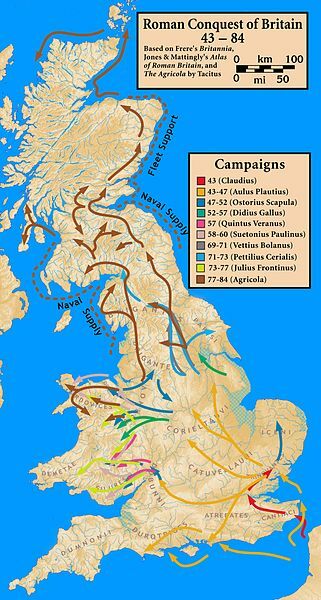 75 – 77AD Roman Conquest of Britain completed The Romans defeated the last of the resistant tribes in the North making all of Britain Roman. 77 – 400AD Life in Roman Britain Under Roman rule the Britons adopted Roman customs, law, religion. Many were taken by the Romans as slaves. 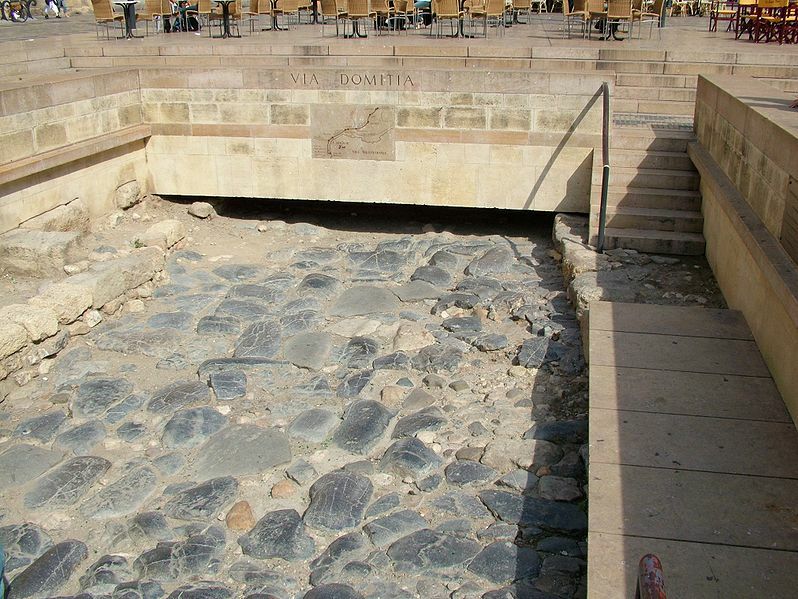 The Romans built many roads, towns, bath houses and buildings. 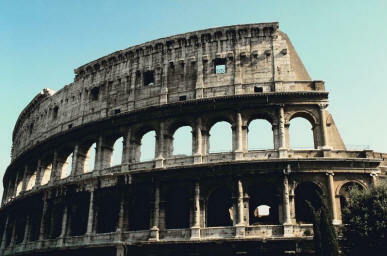 Trade and industry flourished under Roman rule. 79AD Agricola invaded Scotland The Governor of Britain, Agricola, attempted to conquer Scotland for Rome but was unsuccessful. 122AD Hadrian’s Wall built The Emperor Hadrian visited Britain and ordered that a wall be built between England and Scotland to keep the rebellious Scottish tribes out. Construction of the wall began in 122 and was completed by 139. 142AD Antonine Wall Built The Romans made another attempt to conquer southern Scotland and after making some gains built another wall across the land between the Forth and the Clyde. It was abandoned in 160AD. 216AD Britain divided into two provinces In order to better control Britain the Romans divided the land into two provinces. The South was known as Britannia Superior and the North Britannia Inferior. 22nd June 304AD St Alban Martyred Alban became the first Christian Martyr in Britain. The Emperor Diocletian ordered that all Christians should be persecuted. St Alban, a recent convert to Christianity changed places with a local priest who was wanted by the Romans. When he was discovered he was executed at Verulamium (St Albans). 312AD Christianity the official religion of the Empire The Emperor Constantine converted to Christianity and made Christianity legal throughout the Roman Empire. 360sAD Attacks from Picts, Scots, Franks, Saxons Roman Britain was attacked by tribal groups of Picts, Scots, Franks and Saxons. Reinforcements were sent to Britain and the attacks were repelled. 388 – 400AD Romans begin to leave Britain The Roman Empire was being attacked by many different barbarian tribes and soldiers stationed in Britain were recalled to Rome. 410 Last Romans leave Britain All Romans had been recalled to Rome and the Emperor Honorious told the people of Britain that they no longer had a connection to Rome and that they should defend themselves. 500 Ambrosius Aurelianus – British warlord Ambrosius Aurelianus was a British warlord who commanded the victorious Britons at the Battle of Mons Badonicus. The Saxons had pushed the Britons further and further west unchecked until this battle. The story of King Arthur dates from this period. For more resources similar to this Roman Britain timeline, specifically the Roman invasion of Britain, please click here.